Here are the 1/6 Scale Figures on display at the Mondo booth from San Diego Comic-Con 2018. Included here are their figures from Batman: The animated Series, Masters of the Universe, Teenage Mutant Ninja Turtles, God of War, their Mondo Mecha and More. 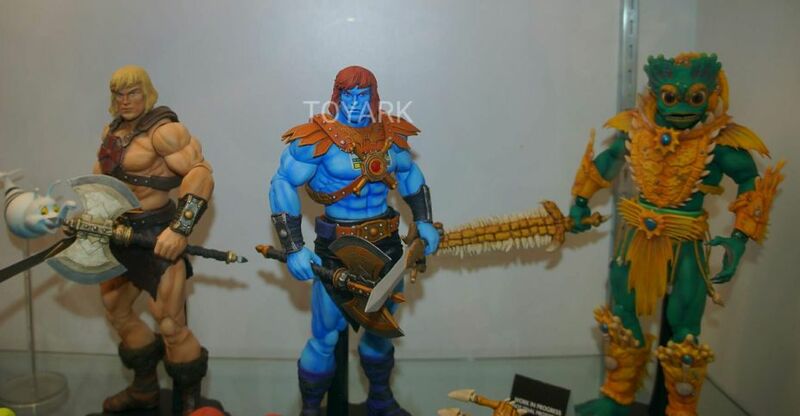 Added photos from the Previews booth for MOTU as well. Read on to see the images. 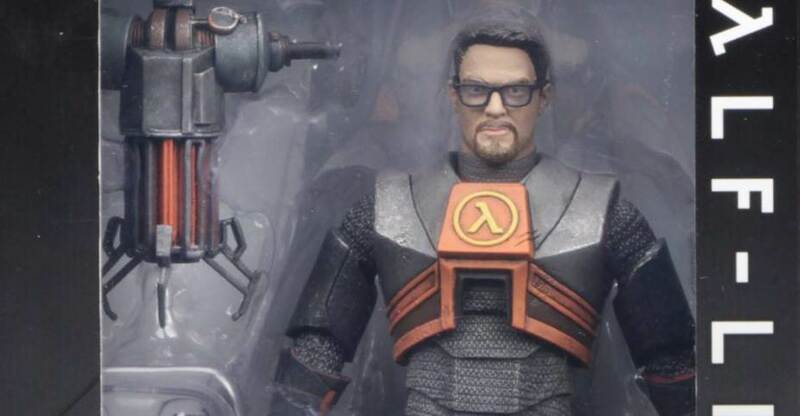 Mondo has fully revealed their new Half-Life 2 – Gordon Freeman 1/6 Scale Figure. They have teased the figure a few times, and SyFy.com had the first official look at the newly announced collectible. 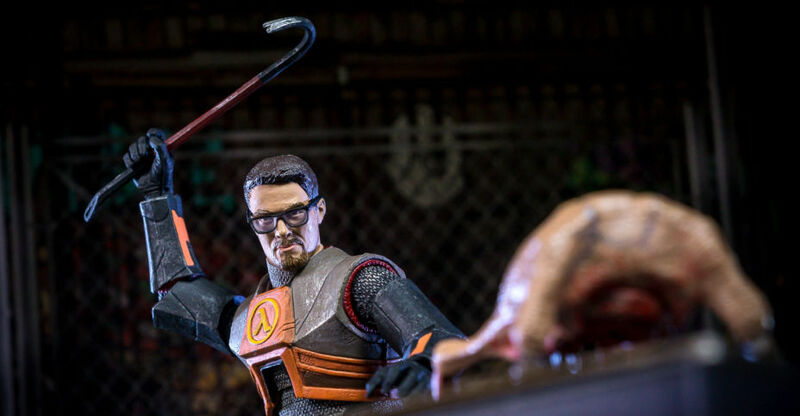 Based on the protagonist from one of Valve’s most popular franchises, the Gordon Freeman figure will include a crowbar, as well as a Head Crab. Other accessories and release details will likely be revealed during San Diego Comic-Con 2018. Click the banner image for the full photo. In 2013, NECA released a 7″ scale action figure based on Gordon Freeman from the insanely popular video game Half-Life 2. The figure has been out of production for the last five years, but fans and collectors can once again get their hands on him. 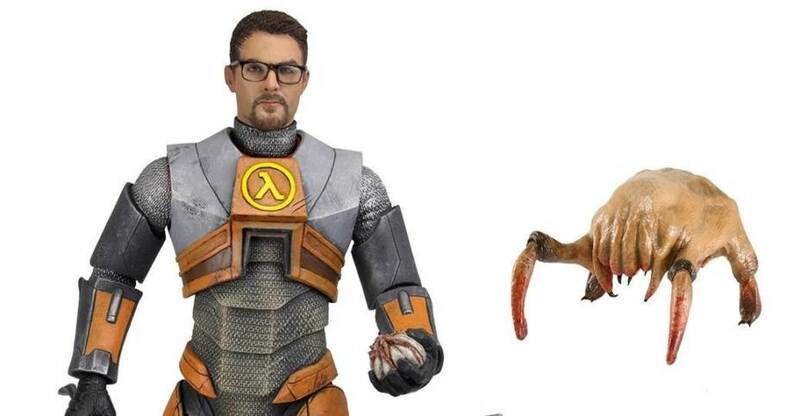 NECA has reissued the Gordon Freeman 7″ Scale figure (who will be joined by Portal 2’s Chell very soon). While the original figure came on the standard clamshell card back, the re-released version is packed in a collector friendly window box. Toyark sponsor Entertainment Earth sent along the figure for us to check out. After the jump, you can see a few quick thoughts on the figure, as well as a full photo shoot. 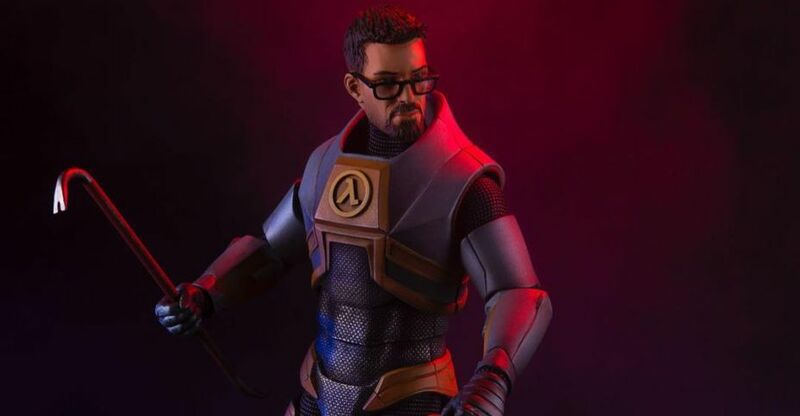 The reissue for the Half-Life 2 – Gordon Freeman 7″ Scale Figure Reissue is available now from the NECA Ebay Store and the NECA Amazon Store. The figure is priced at $24.99 plus shipping. It will begin shipping out to retailers next week, and should begin hitting store shelves and online shops by early June. Click the links to order the figure, and get it now. 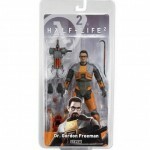 NECA has release new in-packaging photos of their upcoming Half-Life 2 Gordon Freeman 7″ Scale Figure. This is a reissue of the figure that was released in 2013. This re-release will come in all-new collector friendly window box packaging. Look for the figure to be released later this month. Look for their Portal 2 – Chell Figure to be re-released in June as well. See the photos after the jump. Check out the NECA Video Game themed figures from Toy Fair 2018. 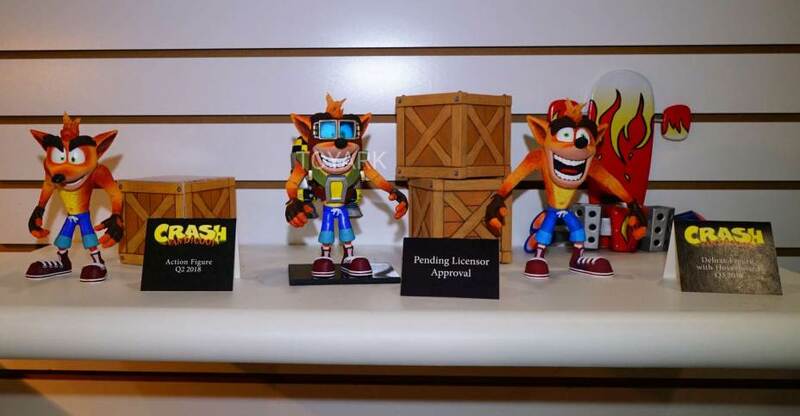 On hand, they had some new variants of their Crash Bandicoot figure. Looks like the first assortments will feature only Crash, with other characters to follow after that. Also on hands were their Team Fortress 2 figures and few more. NECA is reissuing two long out of production Player Select Action Figures! Both Gordon Freeman from Half-Life 2 and Chell from Portal 2 are being re-released. These figures were originally released back in 2013. They have announced the figures will be released in May. Check out details below. You can also see some photos of the figures after the jump. Back by popular demand! From Valve’s award-winning Portal 2 video game, protagonist Chell is depicted in her orange Aperture Laboratories jumpsuit, and stands approximately 7” tall. Chell features over 20 points of articulation to navigate any variety of test chamber scenarios. For science. She comes with an ASHPD accessory that lights up and glows blue just like in the game. Display base and button cell batteries included. 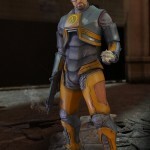 Gaming Heads has a 1/4 Scale Half-Life 2 Gordon Freeman Statue coming soon. It’s scheduled for release in the 3rd quarter of the year with both a standard and exclusive version available. The statue is currently in production and Gaming Heads has posted a gallery of the statue being created in the factory. Read on to check out the behind the scenes images. Gaming Heads has posted the pre-order for their upcoming Half-Life 2 Gordon Freeman 1/4 Scale Polystone Statue. There are two versions. The regular version comes with his trusty crowbar. The exclusive version also comes with the crowbar, but includes a swap out weapon, the Heckler & Koch MP7 gun. 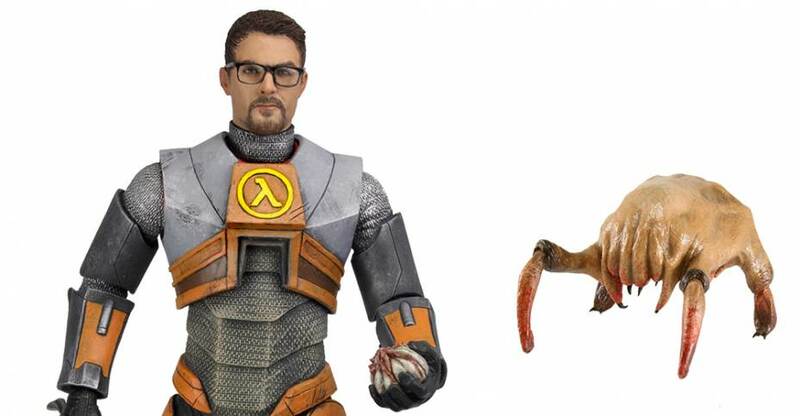 NECA has posted an update on their upcoming Half-Life 2 Gordon Freeman 7″ Action Figure and their Half-Life 2 Headcrab Plush. Both are shipping to stores later this month! Check out some photos by clicking the headline of the story.